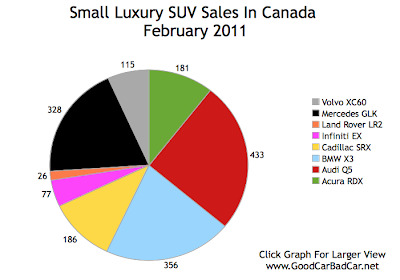 If Acura ZDX sales remained level with February 2010’s level, the Acura ZDX would still possess the shortest bar in the midsize luxury SUV chart below. But, well… um, Acura ZDX sales dropped 63.6% from February 2010 levels. 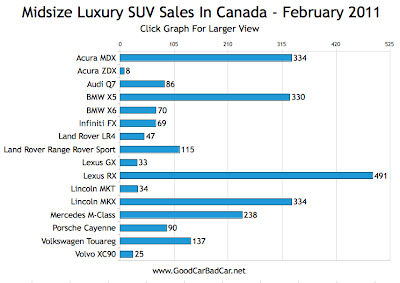 Toyota sold more Land Cruisers in Canada in February, and Toyota doesn’t even try to sell the Land Cruiser in Canada. Seriously. BMW X6 sales were up 32.1% in February; Infiniti FX sales were up 13.1%. 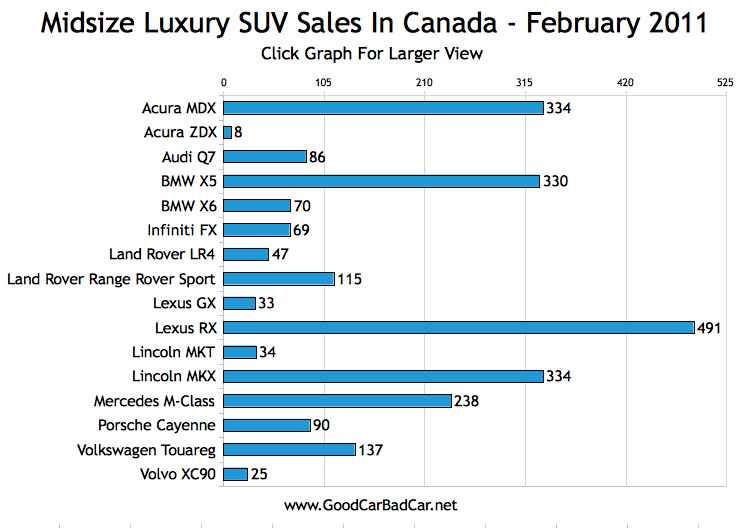 Among more conventional luxury utility vehicles, the Lexus RX350 had its best February ever as sales rose 3.6%. 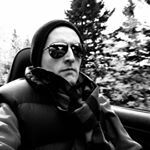 41 of the RXs sold were hybrids. Sales of the RX450h were down 33.9% in February. The Audi Q5, already well-established at this time last year, saw sales rise 183% in February 2011. That was enough of an increase to see the Q5 rise to fourth on the list of Canada’s best-selling luxury vehicles, right behind the Lexus RX. Thanks to the introduction of the second-generation X3, BMW was served a 74.5% year-over-year sales increase of its small SAV.